Contains rectangular, square and round tables spaced for quick and accurate arrangements. It includes other symbols for door swings, chairs, T.V., Podium, etc., Everything necessary in planning room layouts for banquets, seminars or conferences. Contains ¼" scale on top edge of template. Scale ¼"x1'-0". 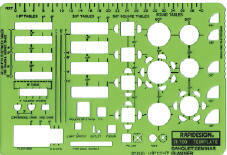 Template size: 8-5/16"x12-1/4"x.030". Printed centering lines. Same as R708 but pocket size. 6-1/8"x4-1/8"x.030"